All paint finishes dull over time because of exposure to the ultraviolet rays in sunlight. This loss of gloss is called oxidation, and an effective way to prevent it from happening is to wax and polish paintwork regularly. Getting rid of paint oxidation and restoring your car to its original luster is a process involving compounding and polishing the paintwork. Compounding rubs away the dull, top layer of oxidized paint, and polishing restores the surface gloss and protects the paintwork. Use an orbital buffer and compound to remove paint oxidation. Spread a small amount of compound cream over the oxidized paintwork with a soft, lint-free cloth or a compounding pad. Mist the pad or cloth lightly with water from a spray bottle before you add the compound cream. Run the orbital buffer over the treated area of paintwork. Start with a speed of 1,000 rpm and gradually increase the speed, working the orbital buffer in a figure-eight pattern. Continue until the cutting cream has taken off the oxidation. Spray the area with a solution of 1 part isopropyl alcohol to 1 part water, and wipe the area with a dry, lint-free cloth. 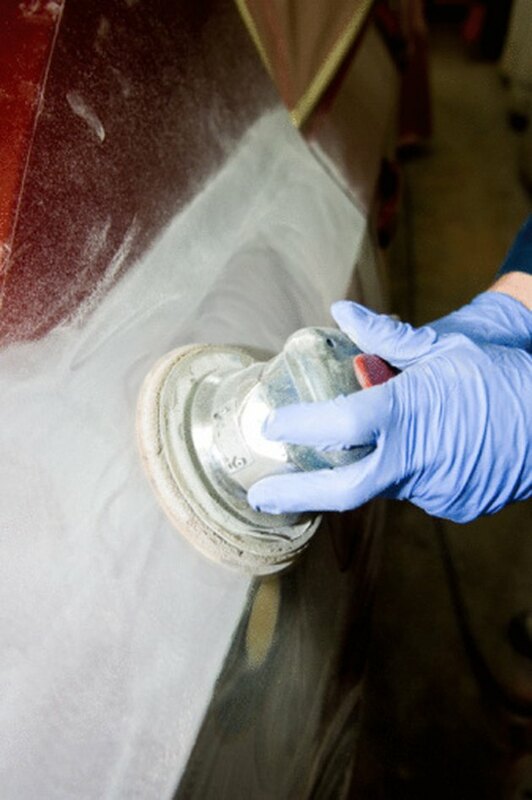 Rub car polish onto the paintwork with a clean, lint-free cloth. Place a clean polishing pad on to the orbital buffer, then use the buffer to rub the polish into the paintwork. Again, start with a speed of 1,000 rpm and gradually increase the speed, working in a figure-eight pattern. Stop buffing when all polish residue has been removed and the paintwork is restored to its full gloss.